saidar is a curses-based application to display system statistics. 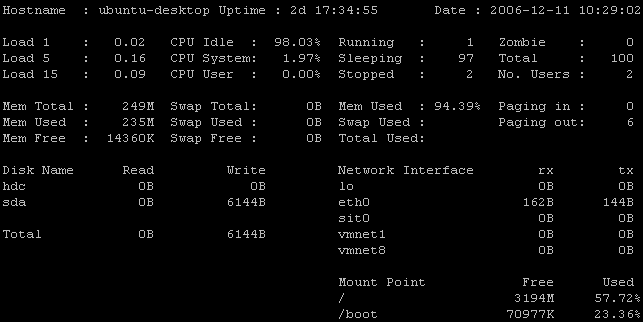 Statistics include CPU, processes, load, memory,swap, network I/O and disks I/O along with their free space. saidar utilizes libstatgrab library. libstatgrab is a library that provides cross platform access to statistics about the system on which it's run. It's written in C and presents a selection of useful interfaces which can be used to access key system statistics. The current list of statistics includes CPU usage, memory utilisation, disk usage, process counts, network traffic, disk I/O, and more. The current list of platforms is Solaris 2.x, Linux 2.2/2.4/2.6, FreeBSD 4.x/5.x, NetBSD 1.6.x, OpenBSD 3.x, DragonFly BSD 1.0, HP-UX, and Cygwin. The aim is to extend this to include as many operating systems as possible. network I/O and disks I/O along with their free space.